Aphasia is a devastating condition following stroke which negatively impacts all aspects of communication including speech, comprehension, reading and writing. The opportunity to harness spontaneous brain recovery to achieve communication independence occurs in the early recovery phase following stroke. Research undertaken by ECU has shown that more than 80% of people with aphasia after stroke cannot access early, intensive aphasia therapy. This research has also revealed that people treated with daily, intensive aphasia therapy commenced within 14 days of stroke onset have greater communication independence than those who receive less intensive or no therapy. However, the longer-term effects of very early aphasia therapy are unknown. The VERSE study is a speech rehabilitation trial which targets those who have had a stroke and are having difficulty with their speech and language (aphasia). This is an international trial taking place in 16 hospitals and healthcare sites around Australia and New Zealand. This study is aimed at finding out whether regular and structured aphasia therapy is more effective and cost saving than current standard aphasia therapy. Due to the lack of information about what amount and type of therapy is best, this trial will help us to understand what type and how much therapy would be the best for people in the early phase of recovery. The cost-effectiveness of aphasia therapy in the long term. 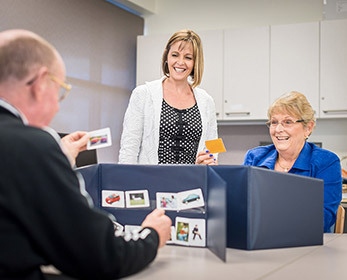 Burgeoning healthcare costs and an aging population dictate that finite aphasia resources must deliver the right type of therapy, provided in the right amount, at the right time to the right person. In addition, the project will provide the first prescribed therapy package for people with aphasia following stroke. This therapy package will assist healthcare workers and speech pathologists across Australia and overseas to deliver the best services available to improve communication for people after stroke. VERSE aims to assist in the understanding of the relationship between aphasia, stroke brain recovery patterns by using a novel ‘brain mapping’ technique to help identify people who will respond well to early, intensive treatment. VERSE will provide Australia’s first full evaluation of the costs of aphasia on the healthcare systems across the country. This project is funded by National Health and Medical Research Council, Australia and The Tavistock Trust for Aphasia, UK. The VERSE project collaborates with the University of Melbourne and the Florey Institute of Neuroscience and Mental Health. Dr Tapan Rai1, Professor Sandy Middleton2, Associate Professor Anne Whitworth3, Associate Professor Miranda L. Rose4, Professor Audrey Holland5, Professor Graeme J. Hankey6, Professor Dominique Cadilhac7, Professor Julie Bernhardt8.